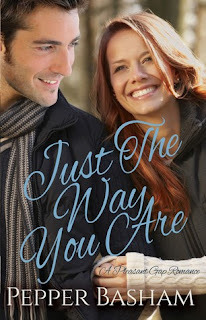 Just the Way You Are is the first installment from Pepper Basham's fabulous new series, Pleasant Gap Romance. Single mom, Eisley Barrett, has had her share of heartache in the past. She travels to England, where she meets Wes Harrison. Wes, too, struggles with his past that leaves him with trust issues and bitterness. After spending time with Eisley, he sees who she is and finds himself falling for her. Wow! This book has a perfect mix I love in a story: Steamy, but clean romance; Laugh out loud humor; Adventure and fun; Suspense and mystery; A beautiful setting. What more could I ask for? Love, love, love this book! YAY!! Thanks so much, Amy!! You are so welcome, Pepper! Thanks for stopping by!